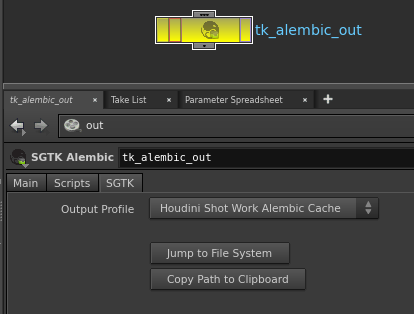 Support for the Toolkit Alembic output node in Houdini. 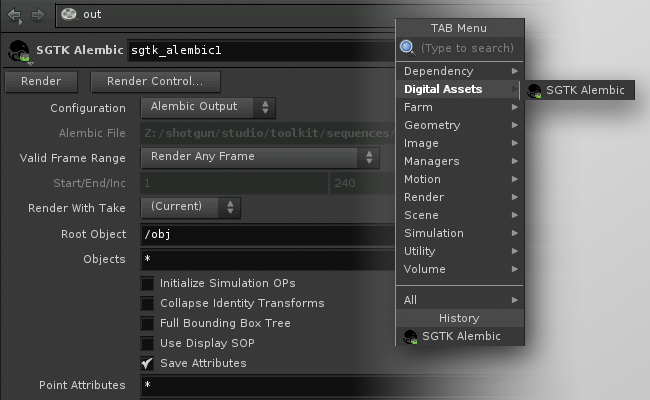 The Houdini Alembic Node App provides a custom Shotgun Alembic Output node which makes it easy to standardise the location where alembic files are output. It can be configured for each environment. The node can be configured with multiple output profiles, each using a different template path for where the alembic cache should be written to disk. Rather than entering a path by hand, you just specify which output profile to use and the node will compute the rest of the path automatically. You can see the computed path in the UI. The output alembic files will be versioned and the version number will always follow the current Houdini scene file version which will be incremented automatically when you publish using Multi Publish. You can use the output profiles to alter the look of the node via the color field, and you can adjust individual parms on the underlying Alembic node by supplying key/value pairs matching those parms in the settings field. Finally, the output_cache_template field drives the output path for the alembic cache written to disk. If you have access to the Shotgun Pipeline Toolkit, you also have access to the source code for all apps, engines and frameworks in Github where we store and manage them. Feel free to evolve these items; use them as a base for further independent development, make changes (and submit pull requests back to us!) or simply tinker with them to see how they have been built and how the toolkit works. You can access this code repository at https://github.com/shotgunsoftware/tk-houdini-alembicnode. You need Shotgun Pipeline Toolkit Core API version v0.12.5 or higher to use this. You need Engine version v0.2.0 or higher to use this. Description: A reference to a template which locates a Houdini work file on disk. This is used to drive the version and optionally the name of output files. 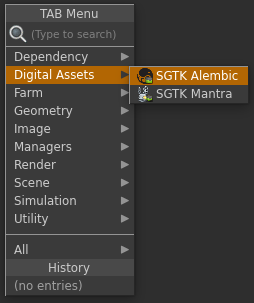 Description: A default name for Alembic output nodes created in houdini. Allowed characters include letters, numbers, periods, dashes, or underscores. Description: A list of dictionaries defining the various alembic output profiles. Each profile contains a unique name that describes the profile, the cach template for writing to disk, a color to distinguish each profile type in the node graph, and optional settings to apply to the internal Alembic node. Welcome to the release notes for this tk-houdini-alembicnode. Below you will find an overview of all the changes we did for each release. We try to be as detailed as possible and include all bugs we have fixed, features we have added and things that may have changed. If you have questions about a particular release, don't hesitate to contact our support team! Fixes a bug with converting to a standard Houdini alembic node. Fixes a bug with setting color values on node profiles. Color values now must be a list of rgb colors with values between 0.0 - 1.0. Fixes a bug where specifying settings for a profile in the app's configuration would cause it to error when creating a node. OTL regenerated in preparation for release. Fixed app so that it will install with the current engine version. - Note that this app is still going through QA and is yet to be officially released!